B&B Salve is a charming home built in the twenties, situated in a small piece of paradisein the south eastof Brussels. The house is located in a peaceful and quiet street, close to public transport, shops and restaurants. B&B Salve is a perfect place to stay during business or leisure trips. Two comfortable rooms, tastefully decorated, with attached bathroom and toilet are available. The rooms are located on the second floor, which is only reserved for one guest (or family) simultaneously. There is a possibility of free parking in front of the house. No experiences yet with B&B Salve . Be the first! Did you stay in B&B Salve ? Let us know what you thought about it and help others to make the right choice! * I confirm having stayed in B&B Salve . 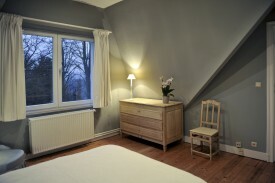 Find other bed & breakfasts in Auderghem or all bed & breakfasts in Brussels.